The Brown Trout is caught less frequently than others because of a very spooky nature. There seem to be quite a bunch of Trophy Browns caught off of the Chicago waters every year. They prefer this area because of the slightly discolored water found in shallower waters. They can also be comfortable in warmer waters than their Salmon cousins. 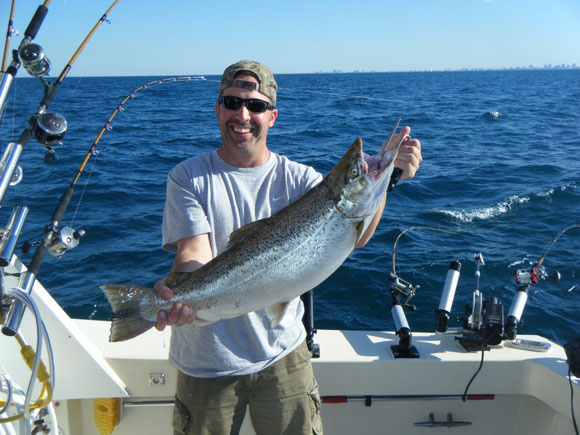 Some big Browns are also caught occasionally in the late summer off of Northpoint Marina. These fish keep fighting even when they are in the cooler. The average size is between 6 & 10lbs however certain genetic strains of Browns can exceed 30lbs. The best times to catch Browns are early spring or during spawning time which is in August. They are the most beautiful and make great mounts because of the large spots on their whole body.